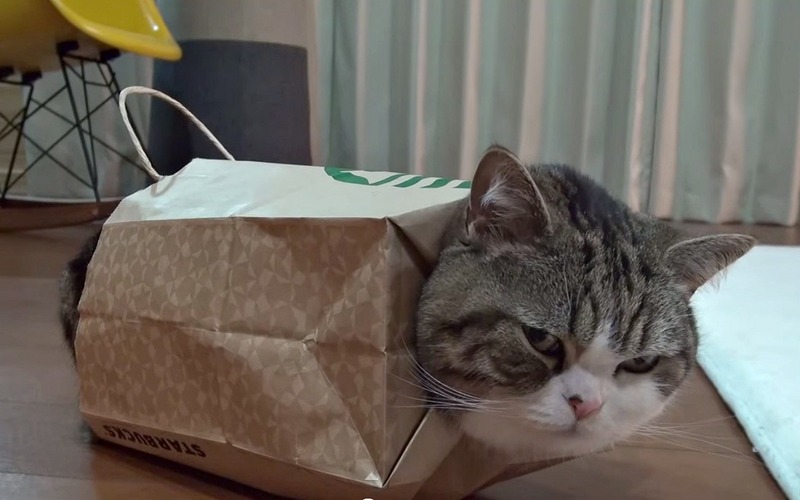 Maru the cat is already famous for his love of boxes, so he decided to change up his image and move on to bags. This dude could not be more content sitting in his bag (which has a special hole in it for his head), and his mood is somehow contagious. Perhaps it’s my tendency to be OCD, but there’s just something about seeing things fit together perfectly that puts me at ease. On what is often the week’s most stressful day, this may be exactly what you need to take a breath and realize everything’s going to work out in the end. It’s certainly what Maru needed, as you can tell by how serene he gets once totally settled inside the bag. The most satisfying parts for me are when his seemingly too-large head pokes through the hole that his owner no doubt fashioned for him, and when he relaxes into the bag, becoming that perfect cat loaf. Cats feel safest when they’re being pressed on all sides — perhaps it’s time for all of us to invest in a human-sized bag or box that we can squeeze into when life gets overwhelming?